Once the plant has bloomed and the bloom dries and falls off, what should I do with the stem which has dried - leave it to dry and fall off naturally or cut it off? With proper care, it should not dry up. They will, typically, produce a second round of flowers, and sometimes even more. You my cut only the dead or drying parts. It can be difficult to get them to reflower without proper knowledge on how to do this. 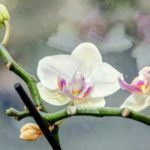 It isn't mentioned in the article, but it is also important to note that many orchids require a change in duration of light to force flower. A pitch black period of over 12 hours per day will help initiate flowering. While Longer light hours will increase leaf growth. These links will give you some more information.